NEW ORLEANS – The gap narrowed at the top of the NCAA Division III Men’s Outdoor Track & Field National Team Rankings. Second-ranked UW-La Crosse closed in on top-ranked North Central (Ill.) in the most recent iteration released Tuesday by the U.S. Track & Field and Cross Country Coaches Association (USTFCCCA). The Eagles sit fewer than 10 points behind the Cardinals following a big weekend. UW-La Crosse received national top-10 marks from Sam Hinz in the 800, Austin Bates in the 110 hurdles and Wes Evansen in the pole vault, all of which chipped away at North Central (Ill.)’s lead. As far as the order of the top-5, nothing changed between Week 6 and Week 7. The Cardinals remained No. 1 for the eighth week in a row and the 16th time in program history. And while the Eagles slimmed North Central (Ill.)’s advantage, they’re still No. 2. UW-La Crosse is followed by Rowan, UW-Whitewater and Augustana (Ill.). There were two notable moves in the top-10 as UMass Dartmouth climbed from No. 10 to No. 8 and UW-Platteville went from No. 13 to No. 9. This is the best outdoor ranking in program history for the Corsairs as they were propelled by George Papoulis’ effort in the 800 this past weekend. Papoulis notched the second fastest time in the nation this season (1:50.03). The Pioneer returned to the top-10 for the first time since Week 3 of last year. UW-Platteville saw Walker Rynes add a national top-10 mark to its ledger in the 5000. Rynes is one of five athletes from UW-Platteville who reside in the top-10 of their respective events. There were two additions to the national top-25: MIT at No. 15 and Texas Lutheran at No. 21. 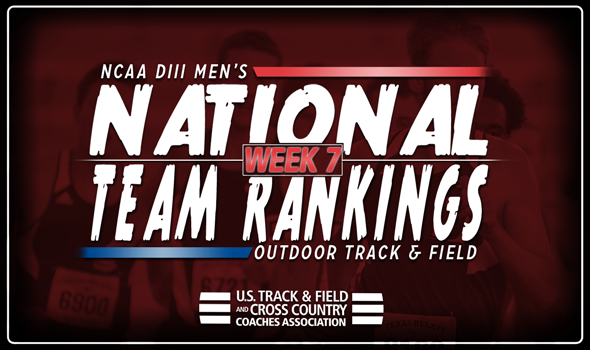 The final National Team Rankings of the regular season will be unveiled on Monday in advance of the 2018 NCAA Division III Outdoor Track & Field Championships, which take place May 24-26 in La Crosse, Wisconsin on the campus of UW-La Crosse.